My brother and I are Greenpoint guys, and also Iraqi veterans. We’re holding a fundraiser On Dec 10 at a local bar (t.b.d. Brooklyn @ 224 Franklin Street; tbdbrooklyn.com) to support a non-profit that means a lot to us: The Wounded Warrior Project. It’s a group that was very good to me when I was recovering from a head wound that I received in battle. I’m writing to see if you would be willing to post some information about the event on your website. It really is a great cause and should be a lot of fun. The price of admission for this event is a mere $2.00. 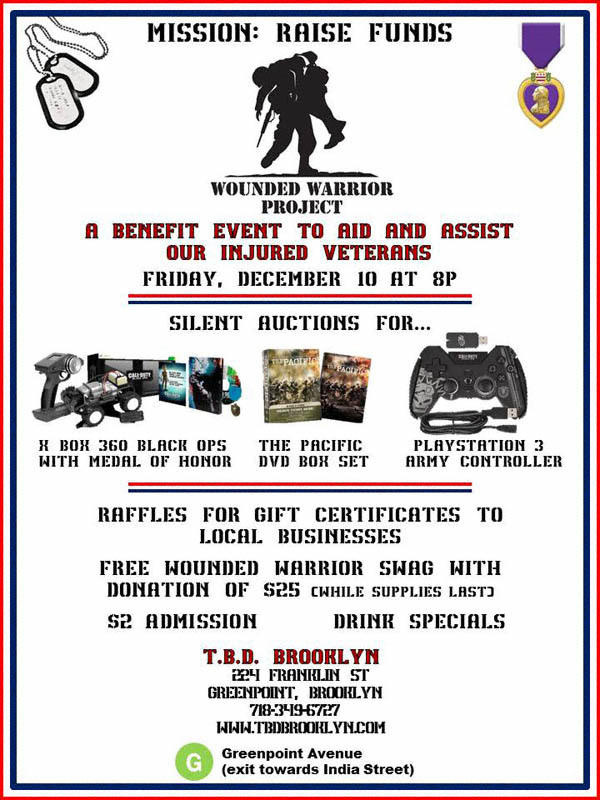 In addition to music and games raffle prizes, including (but not limited to) X Box 360 Black Ops with Medal of Honor, The Pacific DVD Box Set, PlayStation 3 Army Controller and gift certificates from local businesses. Check it out! December 10, 2010 starting at 8:00 p.m.
You can also get more details about this event via t.b.d.’s Facebook page. I know a lot of folks reading this have furkids of the snorting variety. Having grown-up with an English bulldog myself, Amos, let’s just say I have a fondness for such critters. Amos was not exactly the sharpest knife in the drawer— but that is what made him so darned interesting. For starters, anything that could would invariably find it way into this animal’s mouth (and face certain annihilation). This included (but was not limited to) a great number of my dolls. Being a tomboy (and as such much more interested in Legos and Erector Sets) this didn’t bother me too much. In all seriousness, this sounds like a lot of fun. Be advised there is a weight limit: 25 pounds or less. For more information about this event you are advised to contact Jen at jenschiffer (at) mac (dot) com. Woof! 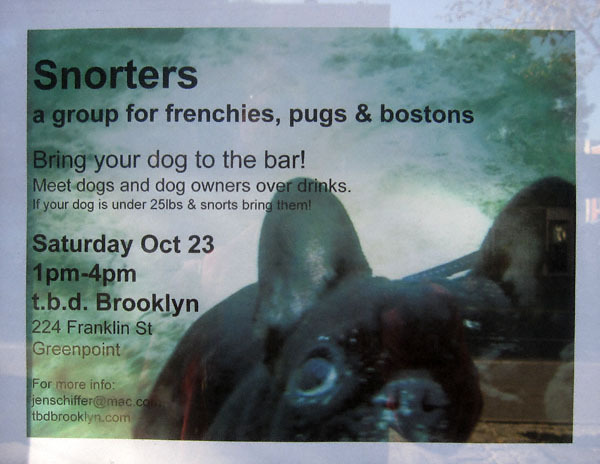 Snorters: Bring Your Dog To The Bar! October 23, 2010 1:00 – 4:00 p.m.
From the beer garden at t.b.d. 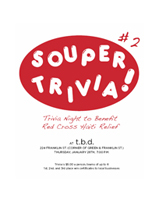 REMINDER: Souper Trivia Night II at t.b.d Tonight! 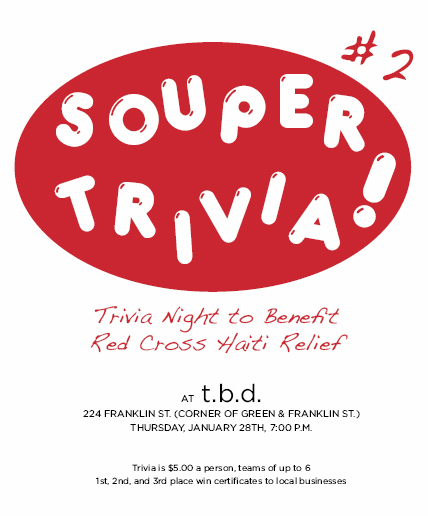 Just a quick reminder that tonight the Greenpoint Reformed Church in partnership with t.b.d will conducting their second Souper Trivia Night with proceeds to benefit Red Cross’s Haiti earthquake humanitarian relief. To sweeten the pot, a prize for “most creative/interesting answer” will be given in addition to the conventional first, second and third place prizes. This was yours truly’s idea as I found myself muttering some pretty, um, colorful answers when stumped at the first Souper Trivia soiree. Hope to see you there! January 28, 2010 starting at 7:00 p.m.
You can get the full rundown on tonight’s event by clicking here. A lot of people have been horrified by the aftermath of the earthquake in Haiti. Of all the people I know none more so than my friend, poet and Greenpoint fashion plate extraordinaire, Philip. As it would happen he hails from Haiti. He told me when he saw the church he in which he was baptized rendered to a pile of rubble he was devastated. Buildings can inevitably be replaced, human lives cannot. This is why I was incredibly happy to learn that the folks at the Greenpoint Reformed Church and t.b.d. have organized a benefit for Red Cross Haiti Relief. 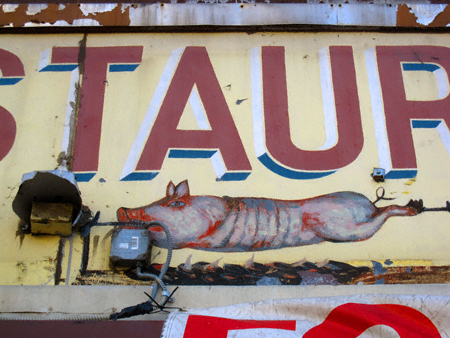 Thank you for donating a photograph to the silent auction of the Souper Trivia fundraiser for the Greenpoint Soup Kitchen (I am now the happy owner of said photograph, as I bid on it and won it) and for including the event on newyorkshitty.com. There will be another trivia night fundraiser @ t.b.d. on Thursday, January 28th @ 7:00; this time, all proceeds will go to the Red Cross’s Haiti Relief Fund. The format will be the same: $5 a person to play, teams of up to 6, 5 categories of 10 questions each, plus a picture round. 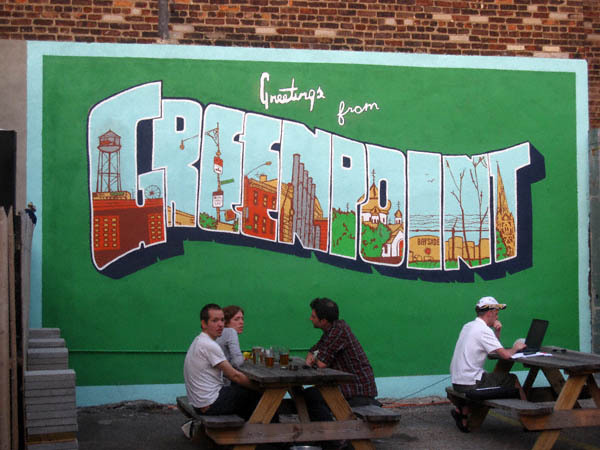 1st, 2nd & 3rd place prizes are gift certificates to local Greenpoint establishments. Ann will be the MC. The only difference is that this time there will not be a raffle or silent auction. Please come if you can. And we would be very grateful if you could include the event on newyorkshitty.com. Duly posted, Samara— and thanks for the kind words. In closing I would like to make it known to all business owners reading this that you too can help by donating prizes. Here’s the deal: they need to in increments of six. After the first Souper Trivia Night concluded a problem arose: as prizes were given out to the winning teams it was discovered they could not be distributed evenly to the winners of six teams! Thus far The Brooklyn Kitchen has donated six gift certificates of $20 each as prizes for a winning team. I will be contributing six photographs to be given out as prizes as well. Use your creativity and your heart: donate a prize. It’s for a very worthy cause. UPDATE, January 26, 2010; There will also be a prize for most creative and/or compelling answer to a trivia question! All good things must come to an end. 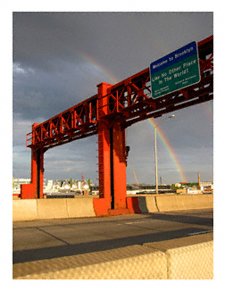 For this reason I wanted to remind everyone that this upcoming Thursday, January 7, 2010 will be the closing date for my show of photography, Brookland, at t.b.d. Quite frankly I am a little “festivitied out” after the holidays but will be there from 7:30 – 8:30p.m. to meet and greet folks, sign pieces for those who have purchased them and hopefully sell a few more! Those of you who have the time and the inclination to brave this frigid weather please swing by and say “hi”. I’d love to meet you! January 7, 2010; 7:30 – 8:30 p.m. Yesterday I shared with you the good news (for holiday shopping procrastinators like myself, anyway) about the Greenpoint Reformed Church’s Holiday Flea Market. Well, I have even more local shopping goodness to pass along: there will be a second sale the same day only blocks away! 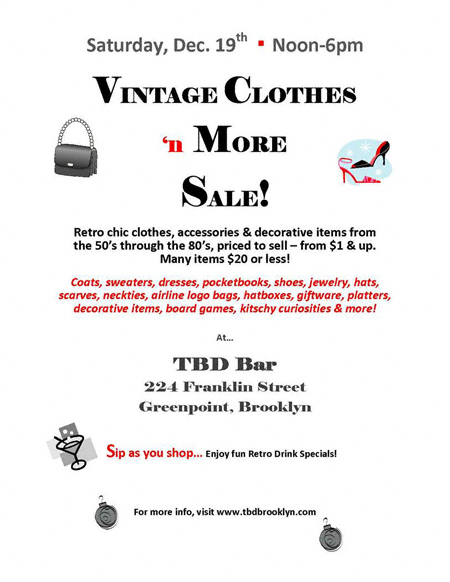 Among the goodies promised at this event are vintage apparel, hatboxes, decorative items, kitschy curiosities and “retro drink specials”. Although I myself make it a point to never drink and shop (it’s hazardous to my wallet) this sounds like a mighty fun way to get one’s holiday shopping done while buying local. Check it out! 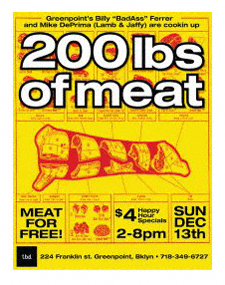 December 19, 2009; 12:00 – 6:00 p.m.
Greenpointâ€™s Billy â€œBadAssâ€ Ferrer and Mike DePrima (Lamb & Jaffy) are cookin up 200 lbs of meat (provided by Lance Jager). 120 lbs of pork ribs!!! 80 lbs of beef brisket!!! We’re gonna have a DJ and there’s football on the big flat screens!! December 13, 2009 2:00 – 8:00 p.m.
*Disclosure: I am a vegetarian. – I have been running myself ragged lately. This is mostly due to the fact I have been trying to balance my life and this web site with the demands of this show. I’m tired! – For this reason tomorrow, starting at 7:30 p.m., I will be having a “soft opening”. I’ll just be hanging out, talking to people who swing by, etc. – In January I will have a more proper closing reception. I will post the details about this at a later date. Those of you who looking for free food and the like will probably want to attend the latter most. Otherwise, I hope to see you all tomorrow at t.b.d.! I have put a lot of work into this show and can’t wait to see the final product! As I have mentioned before these works will be for sale and will start atÂ the very reasonable price of $25.00! P.S. : Be sure to check out the reception at Clayspace too! 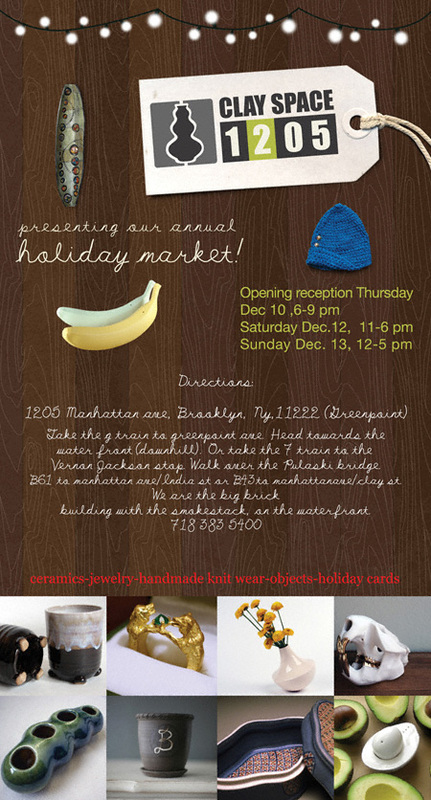 THIS WEEK: Holiday Market at Clayspace & More! I went to this event last year. I was not in the least bit disappointed! It was a most enjoyable evening. For this reason I strongly recommend— even if you cannot afford their wares (which are absolutely stunning)— that you go! You’ll meet some of the most talented (and downright nice) crafters and kiln cats in the Garden Spot! Opening reception: Thursday, December 10, 6:00 – 9:00 p.m.
Market Hours: Saturday, December 12, 11:00 a.m. – 6:00 p.m.
Sunday, December 13, 12:00 – 5:00 p.m. When the deets become firm I will post more details.